Did we see it? Intelligence agencies of other countries are worse! It was 3:25 pm in the afternoon when I passed in front of the East Gate, it was drizzling.When I arrived nearby the Blue House at 3:39 pm, someone in plain clothes at the spot where the police was standing told me in an aggressive tone that I could not go, unlike before. (He is called Myong Hwan X. He has distinctive skin, looks a little taller than I am, and thinly built. In the process of their blocking the road and instigating me, I raise my voice to talk about the terror activities of their colleagues. In the middle of my talking about terrorism, he has tics on his face.) 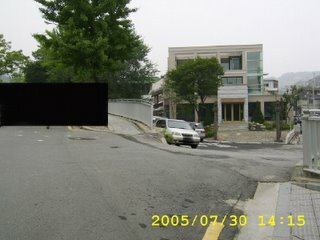 In response to my coming to the front of the Blue House today, President Moo-hyun Roh’s Blue House shows “power exercise” to get rid of my will to resist by mobilizing agents and policemen, and “exercise of lawless public power that can arbitrarily do anything to an individual through stirring up disputes”. In the past, when I went there, I saw two adult men who brought large pickets with something written on it in front of the Blue House yelling toward the Blue House swinging their arms. An elderly man among them was there whenever I went to the Blue House. They were not subject to any restraint at all. And other people also came to the front with pickets with appeals written on them while I was there for about one hour. All I had while carrying out a silent protest were a ball pen and a notebook. Does Blue House feel burdened by such a quiet protest? Does President Roh Moo-hyun’s Blue House feel so burdened by a ball pen and a pocket notebook? Is it such an unbearable pressure that I tell them in quiet voice what they want to hear? Is it such an unbearable psychological burden on the Blue House when a terror victim sits on a stone for one hour and then leaves? Many people appeared without identifying themselves, striking conversation in turn, what’s up, and showed diverse behaviors, words, and facial expressions to instigate me. I was constrained, and told I could not go any further. Thus I had to raise my voice and tell them about the protest. I told them about their activities mobilizing even foreign people in biological agent using terror. There was even a monitoring camera in front of me, but a person in plain clothes who came from the direction of Blue House brought a digital camera and took pictures. Among those who put on plain clothes, there are some who picked a quarrel with mean words. When I mentioned about terrorism, one of the agents in plain clothes laughed and said, “Did we see it?”. Agents play with words about the terror suffered by another. While the three persons in plain clothes were blocking the road, there was a person who ordered them not to respond to me at all. Three persons in plain clothes and the police forcefully dragged me to a nearby small Sam Chung Police Station. A little while after I arrived at the police station dragged by these four persons, they brought back the umbrella that they had taken. I washed my dusty hands in the narrow and dark restroom of the police station. After showing the resident card at the demand of the police, I left the police behind who told me to go, and moved forward to the Blue House again around 4:12pm. In order to go to the front of the Blue House again, I take small sideways that the above four persons used to drag me to the police station. I go back to the location where I was originally blocked and protest. The protest was extended from one hour to one and a half hour due to the exercise of power by the police and the agents located in front of the Blue House to silence the memory of terror. After about one and a half hour I told the staffs in front of the Blue House that I am leaving so that they could hear, and two policemen brought a patrol car and forcefully dragged me to the car. The two policemen forcefully push me into the patrol car at 5:8. The person called Dong-Ho Lee in police uniform tells me he would drop me at Chong Ro 3-Ga. 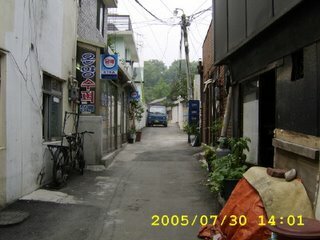 They say something like they would take me to Han Kang Ro so that I would have a hard time, and pick a quarrel with me. They even add the words “Do you have money to take a cab?”. Are they trying to scare me? The police say these words to a terror victim? What’s the purpose? Lawless political power can do a lot of things to erase the memory of terror. Does the Blue House mean that the terror and conspiracy of foreign intelligence agencies are worse than the conspiracy and terror of DSC officer Yang-Hong Bae and Vice Minister rank Ambassador Dae-Hwa Choi that I experienced? Shouldn’t they say these words only when they know what I went through and are in a position to compare? Is it because the intelligence agencies of other countries are more evil that President Dae-Jung Kim’s errand men mobilize even the foreign people in biological agent using terror? Should they be allowed to commit the act of using drug and germs against a citizen? Can President Moo-hyun Roh’s Blue House talk about protecting human rights and clearing up the past history while exercising this kind of force to erase the memory of terror? Does the Blue House mean that only those that suit its taste shall be the object of clearing up the past history? Protecting human rights, clearing up organized gangster culture, and clearing up the past history will be facilitated if a political power moves away from political violence. The two policemen who forcefully put me in the patrol car told me they would call home. Saying this and that, they speak loudly to intimidate me. 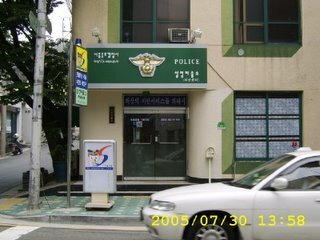 The policeman’s name was Dong-Ho Lee. Dong-Ho Lee’s attitudes remind me of the moment when the terrorists threatened to harm my family.When I talked about punishing those in public office that participated in improper things, the police in the car said that it was also violence. When I said that it is the Heaven’s will that evil should disappear, the two policemen who forcefully put me in the car did not say very much. “We can get any kinds of weapons”, they said. Also when I was in danger by those who approached me saying they would supply the Korean peninsula with illegal weaponry, the person who spurned those as crazy was Councilor Kang-Hyun Jung of the Embassy. Just as their saying “Did we see it?” in front of the Blue House and trying to subdue me with their physical power and making me leave the front of the Blue House, Councilor Jung was occupied with pushing me out of the Embassy. I have a memory of giving Councilor Jung a book on Mafia. I gave it so that he would protect people from this kind of people. After Jung refused to help, the organization including the errand men under Vice Minister rank Ambassador Dae-Hwa Choi’s command such as Gil-Sang Nho and Jeon Yeum, etc. continued to attempt to kidnap and murder. What would be the reason that the errand men of President Moo-hyun Roh intentionally harass me and remind me of their existence? Isn’t it a strange advocate of human rights if they attempt kidnapping and assassination and suppress to silence the memory of terror while arguing for the abolition of death penalty system! Today, the Blue House of President Roh Moo-hyun, who is an ex-human rights lawyer, showed the attitudes towards the terror victims well. Says, “Did we see it?” to a citizen who is a victim of terrorism. 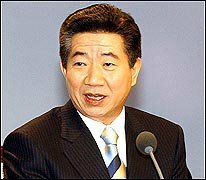 “Intelligence agencies of other countries are worse” is the expression of the intention of the Blue House of President Roh Moo-hyun. Look at the military, civil employees, and politicians who fight against terrorism to protect the freedom and life of their own citizens! In this way, can you build a society where a citizen of the Republic of Korea can enjoy the dignity he was born with? As a representative case under the military government, the incident that occurred in Europe was selected as target for investigation. President Kim Dae-Jung’s Peoples’ Government was not a military power but a power elected by people. It is an example of terrorism carried out by a government not by military power but by people that Kim Dae-Jung’s power manipulated a powerless citizen as anti-government activist, accusing him to be leftist and extreme right, turning him into a prey of terrorism, kidnapping and murdering, and trying to suppress human rights. Unimaginable political terrorist activities perpetrated under the Peoples’ government elected by the people are the problems not of the past but of the present. Oppression to conceal the terrorism should be stopped, and the record of this terrorism should be revealed to the citizens before dealing with the past history. Is it evil when it is perpetrated by a military government, and good when by a civilian government? Shouting justice and democracy of this society on one hand, how dare say “Did we see it?” and “Intelligence agencies of other countries are worse”! Why do those politicians who shouted for democracy keep silent, and what are they doing? Is a new world opening up where political oppression is the protection of human rights? When I asked that oppression be stopped, the person said “So you still want to live!” and revealed the cruelty of using pain-inflicting chemicals to a terror victim. Such a negative symptom is the expression of the political egotism of intelligence agency and the despotism that was revealed through the intelligence agency privatized for personal interest of those in political power. Although there are accumulated national tasks such as eliminating regional conflicts and settling democracy, the NIS is going against them by manipulating regional sentiments, and by carrying out political schemes and political oppression. Although President Roh Moo-hyun’s Blue House should cut and clear away from political authoritarianism, it is rather raising it bigger. What is reformative is correcting what is wrong to be right and is fundamentally different from trying to conceal and erase the memory of terrorism by oppressing the victim of terrorism. In order to build Korea where people can live with awareness as citizen, it should not stop as mere slogan at the level of political operation, but there is a need to practice discontinuing and clearing up the darkness of the past. Wouldn’t it become a beautiful society and country only when the right continues and the wrong is corrected to be right! 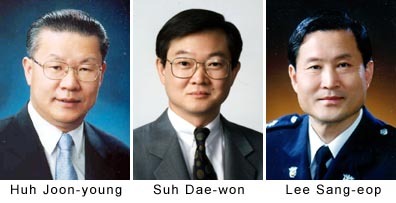 In order to stop any further cruel terrorism, newly appointed Minister of Justice Jung-Bae Chun and President Moo-hyun Roh of Blue House should let the citizens know about the record of political terrorism committed by President Kim Dae-Jung’s Peoples’ Government through errand men in Brussels. I enjoyed reading all the aikido best budo founder karate teachings information on your site. You can check out my aikido best budo founder karate teachings site if you like. I enjoyed reading all the secret of aikido information on your site. You can check out my secret of aikido site if you like. You have a great site here on karate supply. I also run a karate supply site that you and your visitors may find interesting.